Being the largest means that we have a huge range of vehicles available for hire, so we can make sure you have the right bus or coach to suit your particular needs. Learn more about our fleet. It also means that we have a large team so, from the time you call, we can be on the road to you within half an hour. We do everything we can to make sure you talk to the same person every time you speak with us. If you want to travel within (or start your trip from) South East Queensland, we can take your group where you want to go - anywhere around Australia. 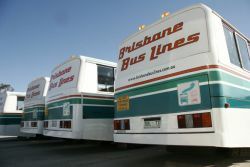 From a short trip around Brisbane or a tour to Broome - anywhere a bus can travel safely. Our head office and main depot is in Enoggera - only a few minutes away from the city of Brisbane. Are you driven to drive? We currently have vacancies for Driving Staff. Days, Nights or Weekends are available.